A stately pleasure-dome shining with blue, green, red, and white lights has sprung up outside Jaffa Gate, at the entrance to Jerusalem’s Old City. Created for the week-long Jerusalem Light Festival by the Italian Luminarie de Cagna, the installation’s 63,000 bulbs are mounted on a frame that is as high as it is wide, like the Pantheon of ancient Rome. The three festival routes wind through the Old City, each studded with innovative light displays. The orange route, which I followed last night, goes from Jaffa Gate through the Armenian Quarter to the Jewish Quarter. In the Armenian Quarter, the narrow street was festooned with plastic pipes lit with white and yellow LED bulbs, resembling a cross between pollen and jellyfish, created by the French group Pitaya. At the eastern edge of the Armenian Quarter, above the remains of a 6th century CE Byzantine church, constantly rapidly patterns of white light appeared on the Old City walls, accompanied by music. This interesting work was the outcome of a collaboration between an Israeli artist, a Turkish musician, and a German light expert. These are but a few of the very attractive installations in the festival, which include works by artists from Israel and eight European countries. The festival continues through June 14 and is open to the public free of charge. Now in its fourth year, it appears to be immensely popular: I saw thousands upon thousands of visitors, both locals (including Israelis and Palestinians) and tourists, thronging the Old City streets. A friend pointed out this week that Israel is awash with festivals, including the Israel Festival (mainly in Jerusalem) and the Opera at Masada festival, both under way now, and film festivals scheduled later in the summer in several cities, to name but a few. Judging by the crowds, they meet a need. 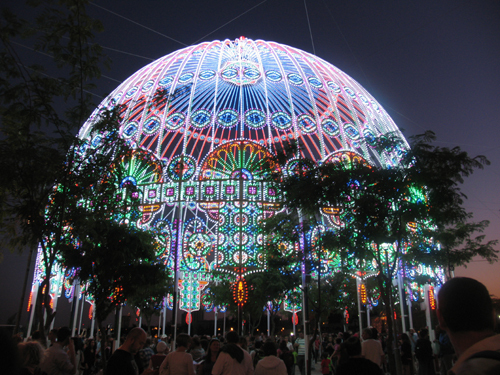 The Jerusalem Light Festival also includes two performances for which tickets are sold. I saw a light-and-sound show titled Currents, by the Israeli Mayumana (pronounced Mah-YOO-mana) Group. The show combines percussion, dance, acrobatics, original music and video (screened on the Old City walls). The story line (the contest between Thomas Edison and Nikola Tesla) was lost on me, but I very much enjoyed the show, which is the perfect complement to the light installations. I couldn’t help wondering, however, how the very loud percussion sounds were affecting the Old City residents. Hila Baggio of the Israeli Opera said the singers had to contend with desert sandstorms and being too far from the conductor to see his eyes. Performing opera in the desert is so taxing, it’s small wonder that both sopranos who were to sing Carmen at Masada were unable to appear in the dress rehearsal last Wednesday. With just a few hours’ notice, understudy Na’ama Goldman, 27, had to take over for Anna Malavesi. And the following night, at the premiere, Goldman had to step in again, this time for the last two acts, after the desert aridity left Nancy Fabiola Herrera unable to continue. It was the first time an understudy had taken over from a lead soloist in a premiere of an Israeli Opera production. But Goldman even took her death by stabbing in stride. 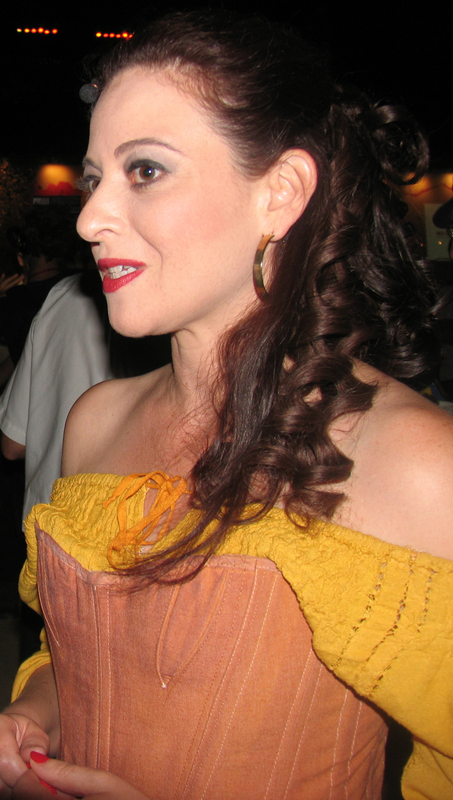 Hila Baggio, who played Carmen’s friend Frasquita, in an interview before the dress rehearsal named some of the difficulties of performing in the desert. “The atmosphere is amazing, [but] we had a desert storm with sand. It’s very dry. We’re drinking like crazy. That’s the only thing we can do,” she said. “The acoustics are not good [and] we have to rely on the sound system,” she added. Each singer must be “wired,” with a microphone hidden in the hair. And yet, the performance of Carmen was enjoyable, and Goldman rose to the occasion in the most remarkable way. The flamenco dancers from Spain clapped, tapped, and stamped, providing plenty of color and movement, and the children’s choir was excellent. Maria Agresta sang the role of Micaela with heart-melting sweetness. And now for the Jewish connection: Georges Bizet’s wife was Genevieve Halévy, at whose popular salon in Paris members of high society could rub shoulders with writers and intellectuals. Later her salon hosted supporters of Dreyfus, including Marcel Proust. Her cousin Ludovic Halévy co-authored the libretto for Carmen. Opera at Masada, near the Dead Sea, is now in its third year, and I’ve had the pleasure of seeing all the productions, including Aida and Nabucco, so comparisons are inevitable. The very different style of those operas, in which everything is on a grander scale, seemed more suited to the monumental setting than Carmen. And whereas in the previous productions Masada was used as a foil to the stage set, this time the mountain simply melted into the set—a kind of Wild West with rocky hillocks. And yet it was exciting to be there, along with the audience of 6,500. Opera at Masada is almost like a mirage, appearing suddenly in this UNESCO World Heritage Site in the desert and disappearing after two weeks, with its many tons of lighting and sound equipment, bleachers, dressing rooms, catering services, costumes, stage sets, and horses (there were 10 in this production). Eitan Campbell, director of the Masada National Park, said it was not easy to decide to have the opera there. But he realized that a 20-acre space that had been primarily a garbage dump and a drilling site, in the buffer zone between the national park and its surroundings, could be transformed into a reception area with all the services needed by the audience and the cast. If they come back next year, they will find that the mirage has reappeared, this time in the form of Turandot.